Questioning if your existing mix is really stabilized? This is a new and improved version of the original stabilized infield mix developed in Southern California, guaranteed to be stabilized. 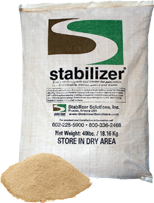 Stabilizer Gold's engineered particle size, fuses the right amount of sand, silt and clay to provide load bearing and shear strength reinforcement that your athlete needs. The Stabilizer Water Binding Technology keeps your field's ideal moisture content window open longer during dry periods, and when other fields are rained out, you will be playing faster.